Average salary has grown faster than average business income for three of the last five years. This has implications in a country like India. Most people in India are self-employed, with 51.4% of the population falling in that bracket. Krishna Kant and Sachin P Mampatta report. The average person's income hasn't grown as fast as the country's gross domestic product is said to have done. 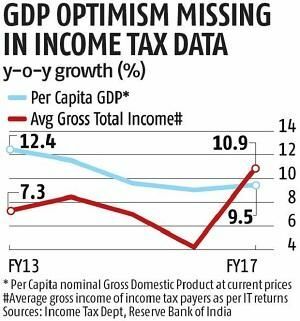 Average income grew slower than per capita GDP in four out of the last five years for which data is available, shows an analysis of income tax data on gross total income and official data on GDP. Gross total income from income tax data is the sum of all income including salary, capital gains, business income and from house property. This income grew from Rs 450,326 in 2012-2013 to Rs 603,499 in 2016-2017 shows income tax data for individuals. Growth has been in single digits for four out of the last five years. The last year showed double-digit growth. 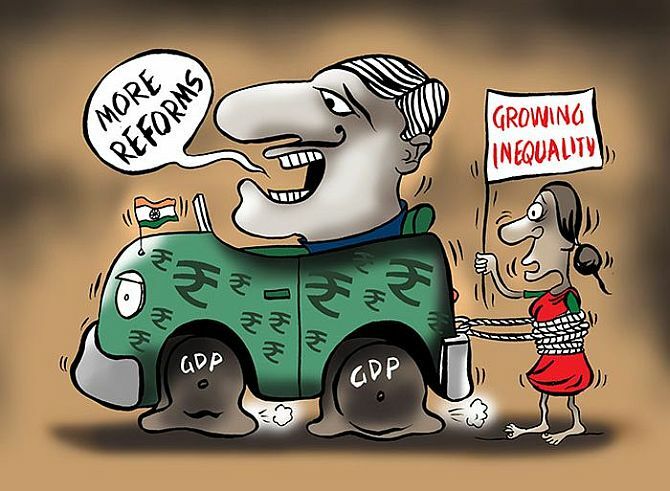 It is also the only one in which growth of average gross total income was higher than per capita GDP growth. The year 2016-2017 is also the year in which demonetisation was announced. The move to withdraw all Rs 500 and Rs 1000 notes overnight coincided with a higher growth in declaration of gross total income. The gross total income declared in 2016-2017 was 10.9 per cent. It was more than twice that of the previous year (4.2 per cent). A closer look at the difference between average salary and average business income growth shows an interesting trend. While a clearer picture may be seen with more granular data, numbers seem to show that average salary has grown faster than average business income for three of the last five years. Average salary income at Rs 341,614 is nearly twice of average business income (Rs 175,409). Most people in India are self-employed, with 51.4 per cent of the population falling in that bracket. Regular or salaried individuals only account for 18.5 per cent of the employment, according to data cited by the International Labour Organisation in its 2018 India Wage Report. The remainder are employed as casual workers. 'The casual labour market consists mainly of people from economically poorer households, 6 engaged in irregular work, compensated on a daily basis and with low levels of education and skills. The incidence of such labour is high among socially disadvantaged groups,' it said. The ILO noted that inequality in wages was a problem as well, across multiple parameters. 'Regional disparities in average wages have increased over time; wages rose more rapidly in high-wage states than in low-wage ones. The gender wage gap also remains very high by international standards,' it said. Nischal Maheshwari, CEO, Centrum Broking, suggested that lack of wage growth reflects the lack of demand on employment, but the government can take steps to remedy the situation. "They have to drive labour intensive industries to drive job demand," he said.